Monoarthritis is an inflammation (infective or non-infective) of a single synovial joint is a huge burden in the healthcare system. Chronic monoarthritis is characterised by its progressive onset and slow development, commonly presenting with mild inflammatory signs. There are various diseases that commonly present as monoarthritis such as tuberculous arthritis, rheumatoid arthritis (RA), juvenile RA, gout, pseudogout, pigmented villonodular synovitis, synovial chondromatosis and seronegative arthritis which includes ankylosing spondylitis, reactive arthritis and the most common cause of chronic monoarthritis in developing countries such as India is tuberculosis (TB). The knee, ankle or hip are most often involved. Monoarthritis usually has high morbidity due to its chronicity and high chances of recurrence. The most commonly used parameters in the diagnosis of chronic monoarthritis are clinical findings such as joint pain, swelling, stiffness and fever; however, these features are non-specific and thus do not help in establishing an accurate diagnosis. Haematological investigations, include routine blood investigations, erythrocyte sedimentation rate (ESR) and C-reactive protein (CRP), may help in differentiating inflammatory from non-inflammatory causes. The clinical findings and fluid biochemistry may be variable, and tuberculin test may be falsely negative or more importantly false positive in a case of tubercular synovitis. Immunological markers such as RA factor, human leucocyte antigen B27 may help in diagnosing RA and seronegative arthritis, respectively; however, the absence of these markers does not exclude the disease. The earliest radiographic findings in tuberculous arthritis are juxta-articular rarefaction and erosions; however, these changes can be seen in all forms of arthritis and hence is considered to be non-specific. The limitation of radiography is its inability to evaluate soft-tissue involvement. Computed tomography (CT) scan is a useful modality for early diagnosis of bony erosion but cannot evaluate soft-tissue pathology. Magnetic resonance imaging (MRI) is superior to CT, radiographs or ultrasound in detecting the early changes of TB in a joint. MRI is evolving as a non-invasive technique in the early diagnosis of tubercular arthritis as it can evaluate the involvement of soft tissues and differentiate various causes of arthritis. Arthroscopy is a minimally invasive technique, traditionally used by orthopaedic surgeons for assessment of the joint as well as for the arthroscopic guided synovial biopsy. Arthroscopic techniques, which enable the selection of synovial tissue under direct vision, were also developed primarily to assist in the diagnosis of arthritis. Synovial biopsy, on the other hand, can accurately diagnose certain conditions by providing adequate tissue for most diagnostic requirements. There is a very little literature existing in the study of early diagnosis of chronic monoarthritis using MRI and comparing its features with synovial biopsy in the definitive diagnosis of peripheral large joint monoarthritis. In this study, we aimed to evaluate the role of clinical, haematological and immunological features in the diagnosis of chronic peripheral large joint monoarthritis, and to assess the role of laboratory tests, radiographs, MRI, synovial biopsy and culture in the early diagnosis of chronic peripheral large joint monoarthritis. This prospective study was carried out at Central Institute of Orthopaedics in collaboration with the Department of Radiology, VMMC and Safdarjung Hospital, New Delhi, for 1½ year between October 2010 and April 2012. Synovial biopsy is either open or arthroscopic guided. Only, the patients with chronic monoarticular arthritis (joint swelling) of any peripheral joint, symptoms for at least 4-week duration and insidious in the onset of symptoms were included in the study. Patients with multiple joint involvements, small joint involvement, already on treatment and prior workup, traumatic joint effusions, neuropathic joints, metallic foreign body in situ (contraindication for MRI) and osteoarthritis were excluded from the study. All the patients included in the study after initial evaluations were subjected to MRI of the involved joint. MRI was performed on patients using a 1.5 Tesla Philips machine using surface coils. Standard T1W, T2W, fat suppression and contrast-enhanced sequences were obtained in axial, coronal and sagittal planes. The MRI studies were evaluated for intra-articular abnormalities that included synovial thickening and fluid collections. The signal intensity characteristics of the abnormal proliferating synovium were assessed. Periarticular abnormalities of the adjacent bone and soft tissues were studied, and these included subchondral marrow oedema, osteomyelitis, cortical erosions, cellulitis, myositis, soft-tissue abscesses and skin ulceration/sinus formation. Then, these patients were evaluated for a pre-anaesthetic check-up and were taken up for arthrocentesis and open biopsy/arthroscopic biopsy performed in the operation theatre. Then, the samples were studied for histopathology, Gram and acid-fast bacilli (AFB) staining and culture for pyogenic and tubercular bacilli. A written informed consent for diagnostic arthroscopy and anaesthesia was taken from all patients after explaining the risks involved in the procedure. Arthroscopy was performed under spinal/general anaesthesia. 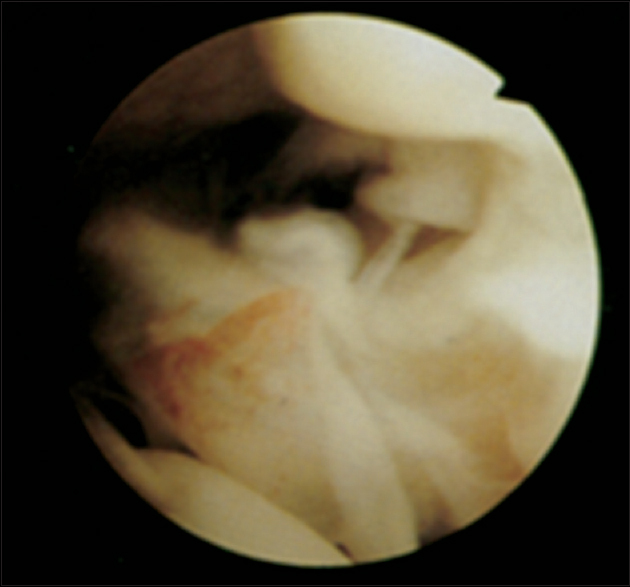 Initial diagnostic arthroscopy was performed, followed by arthroscopic subtotal synovectomy. The arthroscopy was performed under strict aseptic precautions as for any open surgery. Before beginning the procedure, knee joint aspiration was done with a 16G needle, and at least 10 ml of synovial fluid was stored in the sterile container. Tourniquet was used in all the cases without exsanguination. The joint was distended with normal saline before inserting the arthroscope. The anterolateral portal was used for scope insertion. This facilitates the visualisation of almost all the corners of the knee except the posteromedial (which can also be seen with some difficulty). The portal used for instrumentation (punch biopsy) was anteromedial; the following regions of the knee are evaluated systematically: suprapatellar pouch, patellofemoral joint, medial gutter, medial compartment, intercondylar notch, lateral compartment, lateral gutter and posterolateral compartment. A synovial biopsy was taken by using the double-puncture technique. With the arthroscope inserted through the anterolateral portal, punch biopsy forceps was introduced through the anteromedial portal and multiple punch biopsies (at least 5–10) were taken from the areas of hypertrophied or inflamed synovium. At the completion of the procedure, the scope was withdrawn, and the joint was thoroughly irrigated with normal saline. A compression bandage was applied after completion. The second part, a minimum of 3 ml tissue was diluted in normal saline and was sent to the microbiology laboratory for Ziehl–Neelsen staining and culture using Lowenstein–Jensen (LJ) medium. A total of 30 clinically suspected cases of large joint monoarthritis were included in this study. Their clinical features, laboratory findings and radiographic features were analysed in all the cases. MRI of the involved joint was done in all 30 patients. All the patients in our study were <50 years, most of the patients being adolescents and young adults falling in the age group of 11–40 years (73%) [Graph 1]. Our study included 67% males and 33% females. Around 67% of our patients presented within 3 months of onset of symptoms. One patient had presented late, after 1 year of onset of symptoms [Table 1]. Pain (100%) and swelling (93%) were the most common symptoms of patients presenting to us followed by fever and stiffness. Around 17% of the patients had weight loss. The most common clinical sign in our study was tenderness (100%) in the joint line followed by restriction of joint movements (73%), quadriceps wasting (66%), joint effusion (50%) and synovial thickening (40%) [Table 2]. The most common joint involved in our study was the knee joint affecting 70% of the patients followed by elbow joint (17%) and hip joint (7%). Ankle and wrist joint was involved in 3% of the patient each. Thus, weight-bearing joints were the commonly involved joints in our study. Almost 83% of patients in our study had a rise in ESR. CRP and Mantoux test was positive in 50% of patients. Serum uric acid was positive in 6%, rheumatoid factor and ACPA were positive in 3% of patients [Table 3]. X-ray of the knee joint was done in 21 patients, elbow joint in five patients and other large joints in four patients [Graph 2]. The most common radiographic finding in patients with chronic monoarthritis knee was joint effusion (90%) and soft-tissue swelling (87.5%). About 57% of our patients had periarticular osteoporosis and synovial thickening. Erosion of articular surface was present in 47% of patients. Nearly 23% of our patients had reduced joint space, and a calcified nodule within the joint was present in 5% of patients [Figure 1] and [Table 4]. All the patients with chronic elbow monoarthritis had joint effusion and soft-tissue swelling (100%). Periarticular osteoporosis was present in 80% of patients. Erosion of the articular surface and reduced joint space was present in 60% of patients. Thus, the four patients had radiographic evidence of infective arthritis. Periarticular osteoporosis, erosions of the articular surface and reduced joint space were present in two patients. Chest radiographs showed evidence suggestive of pulmonary TB in two patients. The most common radiographic diagnosis was inflammatory arthritis, which was observed in 53% of patients, most commonly of the knee joint. Infective arthritis was observed in 43% of patients; the knee is the most common joint involved yet again. 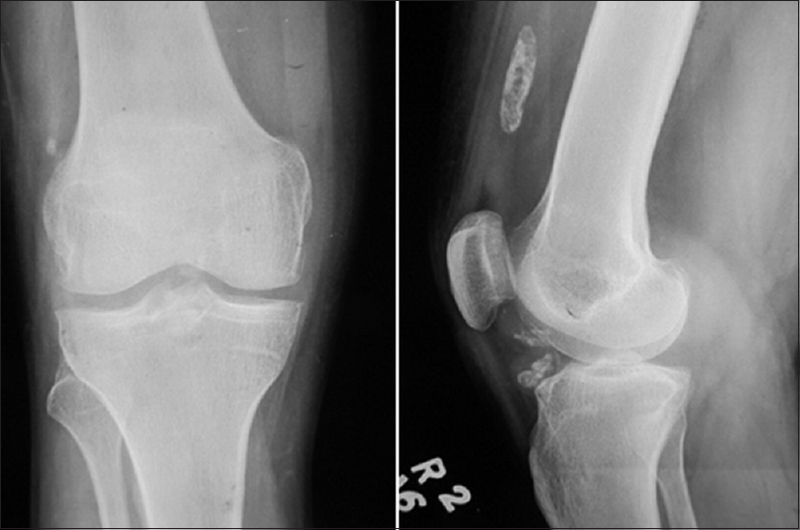 Another radiographic diagnosis which involved the knee joint was synovial chondromatosis seen in one patient [Graph 3]. The MRI studies were evaluated for intra-articular abnormalities which included synovial thickening and fluid collections. Pathological findings on MRI were seen in the knee joint of 21 patients, elbow joint of five patients and other joints including hip and wrist. Joint effusion (100%) and synovial thickening (84%) were the most common MRI finding in our study. Post-contrast enhancement of synovium (80%) and bone marrow oedema (73%) were also common findings [Figure 2]. Rim-enhancing abscess, osteomyelitis and enlargement of lymph nodes were present in 30% of our study population. 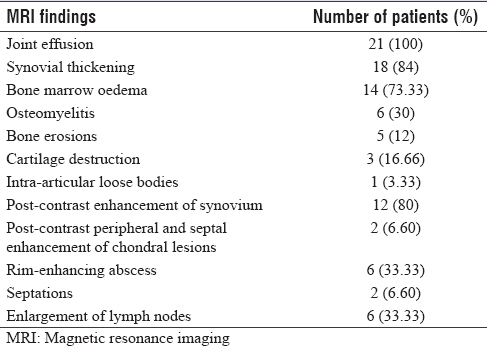 Intra-articular loose bodies were present in one patient, [Figure 3], [Table 5] and [Table 6] 60% of patients had osteomyelitis, bone erosions, bone marrow oedema and cartilage destruction. Synovial thickening, post-contrast enhancement of synovium, abscess, enlarged lymph nodes and bone erosions were present in 50% of patients. In this study, inflammatory arthritis (53%) was the most common MRI diagnosis followed by tubercular arthritis (40%). Other diagnoses include synovial chondromatosis (7%), seen in two patients of our study [Table 7] and [Graph 4]. Arthroscopy was performed in patients with symptoms and signs localised to knee joint were seen in 21 patients. An open synovial biopsy was done in remaining nine patients who had monoarthritis of the elbow (5), hip (2), wrist and ankle joint (one each). 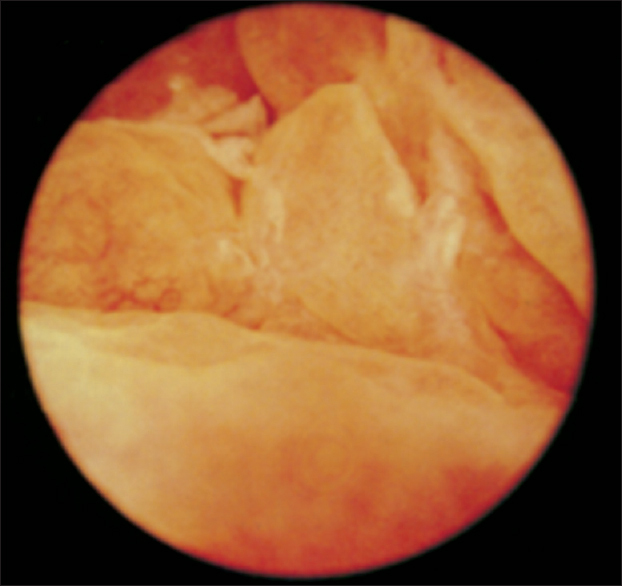 All patients, who were subjected to arthroscopy, had inflamed and hypertrophied synovium [Figure 4]. Villi were thick and greyish in six patients (28.5%), thick polyp-like in eight patients (38%) and thin in seven patients (33.3%). Free-floating vegetation was present in 10 patients (47.6%) and loose bodies in one patient (4.7%). Of 21 patients, 13 patients had arthroscopic findings suggestive of inflammatory arthritis [Figure 4], and seven patients had tubercular synovitis [Figure 5]. One patient had loose bodies suggestive of synovial chondromatosis. The most common histopathological diagnosis was chronic inflammatory arthritis seen in 16 patients out of the total 30. 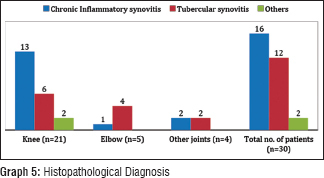 Tubercular synovitis was present in 40% of patients [Graph 5]. 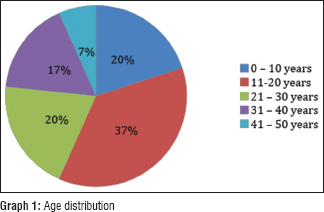 Other diagnosis includes synovial chondromatosis of the knee which was seen in 6% of patients [Graph 5]. Infiltration of lymphocytes and plasma cells was seen in two patients (9.5%). The non-specific inflammatory change was seen in 12 patients (57%). Multiple islands of cartilage in synovial connective tissue were seen in two patients (9.5%). Infiltration of lymphocytes and plasma cells was seen in 25% of patients [Figure 6]. Granuloma, the proliferation of epithelioid cells and non-specific inflammatory changes were seen in 50% of patients [Figure 7]. The early and definitive diagnosis of chronic monoarticular joint disease is crucial for initiating optimal treatment. In the present study, we compared laboratory parameters, conventional radiography, MRI, arthroscopy and synovial biopsy as tools for the early diagnosis of chronic peripheral large joint monoarthritis in 30 patients. The mean age of the patients in our study was 21.23 years with extremes of 4 and 46 years. About 36% of the patients were in their second decade of life (11–20 years). Inaoui et al. reported a mean age of 45.7 years in his study on undifferentiated chronic monoarthritis. In other studies published on tubercular arthritis, Berney et al. reported 60% of patients under the age of 40 years. Allali et al. reported a mean age of 47 years in his review of tubercular arthritis patients, and Lertsrisatit et al. reported a mean age of 49 years in their review of 27 patients. In a large study of 230 patients with tubercular arthritis, Lafond similarly observed a majority of patients aged <35 years. Our study shows a preponderance of male population with 20 males and ten females. Inaoui et al. reported the equal incidence of chronic undifferentiated monoarthritis in both male and female patients. Enarson et al. reported the equal incidence of bone and joint TB in males and females. Lafond found a male preponderance in their large study. Of the 30 patients in the study, the most common complaint was a pain in the large joint (100% patients) followed by swelling (93%). Fever, joint stiffness and loss of weight were other less commonly observed symptoms. This corroborates with the finding of other observers like Hoffman et al. who found that pain and swelling were the most common symptoms of patients presenting with large joint monoarthritis. The most common sign to be elicited was the presence of joint line tenderness seen in all the 30 patients (100%). Terminal restriction of joint movements (73%) was the second most common sign elicited which corroborates with Tuli who showed that joint movement is restricted in more than 50% of patients with early arthritis. Joint effusion was present in 15 patients (50%). Synovial thickening was noted in about 12 patients (40%) this corroborates with the fact that synovial thickening with effusion is a characteristic feature of early tubercular arthritis. Patients presenting with increased duration of complaints showed significant wasting of the quadriceps of the affected side (20 patients). This finding was supported by Tuli where he found that quadriceps wasting was seen in chronic cases of TB knee. In this study, 67% of patients had a duration of symptoms ranging from 1 to 3 months before presenting to us. The maximum duration of symptoms was 1 year seen in a single case. The findings corroborate with those of Razdan et al. who found that 55% of cases presented early within 3 months. The average duration of symptoms was 8 months with the minimum being 1 month. However, this is in contrast to the study by Milgram where the average duration of tubercular arthritis was found to be 3.1 years in 142 cases. 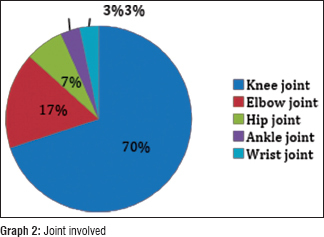 The most commonly involved joint in our study population was the knee joint (70%) followed by an elbow (17%), hip (7%) and ankle and wrist (3%). Inaoui et al. in his study of chronic inflammatory monoarthritis found the knee (54%) to be the most commonly involved joint followed by the wrist joint (24%). He studied the progression of the disease in wrist joint and knee joints. It was concluded that recovery was better when the knee joint was involved. Pitkeathly et al. studied that monoarthritis of the wrist joint progressed to RA in six of seven patients. Women were high-risk candidates for this disease progression. Involvement of the knee joint was thus thought to be a favourable prognostic factor. Of the 12 cases diagnosed with tubercular synovitis, 50% were localised to the knee, 33% of the elbow and 16% hip. This was comparable to the study by Shen et al. where they described weight-bearing joints such as knee and hip are most commonly involved in tubercular arthritis. Martini et al. reported a high proportion of elbow joint being affected in a study of upper limb joint TB (42 of 74 cases). ESR was the most consistently positive laboratory test. It was elevated in 25 (83%) patients. CRP and Mantoux test was positive in only 50% of the study population. Rheumatoid factor and anti-cyclic citrullinated peptide were positive in only 3% of our patients. Inaoui et al. reported in his study that neither the ESR nor CRP were conclusive in the diagnosis of chronic inflammatory monoarthritis. Previous studies have also demonstrated similar results of inconclusiveness in diagnosing chronic inflammatory monoarthritis.,, Auquier et al. demonstrated higher ESR values in patients with definite inflammatory joint disease than among those who recovered within 1 year. Inaoui et al. also concluded that rheumatoid factor and antinuclear factors could not predict the outcome of the disease. Tuli, in his study, described that the increased ESR is not necessarily proof of the activity of infection. ESR is a non-specific test but has an important value from a prognostic point of view. However, Auquier et al. found higher ESR values among patients with the definite inflammatory joint disease. RA factor was present in only one of four patients diagnosed with RA. This was in agreement with Nishimura et al. who reported that a negative RF does not rule out RA; rather, the arthritis is called seronegative which was observed in about 15% of patients. The most common radiographic features seen in the knee joint were joint effusion (90%) and soft-tissue swelling (85.7%). The joint effusion and soft-tissue swelling were observed in all radiographs of the other joints (100%). The radiographic findings suggestive of inflammatory arthritis such as narrowing of joint space, erosions of the articular surface and joint destruction were present in 53.33% of our study population. This finding is in agreement with other studies by Foley-Nolan et al. and Boutry et al. who concluded that conventional radiography only detects late changes such as narrowing of joint space, erosions and thus radiography can provide only indirect information on synovial inflammation, and this technique is insensitive to early bone damage., In this study, radiography had a sensitivity of 62.5% and specificity of 71.43% in the diagnosis of inflammatory arthritis. However, Babyn and Doria reported a sensitivity of 50% and specificity of 85% in their study on inflammatory arthritis. The radiographic features suggestive of infective arthritis were seen in 43.33% of our patients. One patient was diagnosed with synovial chondromatosis. Radiographic features consisting of juxta-articular osteoporosis, peripheral osseous erosions and gradual narrowing of the joint space were seen in eight patients with histology proven tubercular synovitis in our study [Table 8], which was comparable to the study conducted by Ridley et al. Burrill et al. described similar radiographic findings of tubercular synovitis in his study which includes osteopenia, soft-tissue swelling, marginal erosions and concluded these imaging findings are similar to those of other infectious and inflammatory arthritis and are, therefore, non-specific. In this study, conventional radiography was less sensitive (66.67%) in the detection of tubercular arthritis which corroborates with the finding by Martini who showed the sensitivity of radiography was around 50%–60%. In this study, a diagnosis of inflammatory arthritis was made by the MRI in 16 patients (53.33%). Of the 16 patients, 13 of the cases involved the knee joint. Tubercular arthritis was diagnosed using the MRI in 12 patients (40%). Out of 12 cases, six involved the knee joint and four involved the elbow joint. In this study, MRI was found to be highly sensitive (83.33%) and specific (88.8%) in the diagnosis of tubercular arthritis [Table 9] which was comparable to studies by Sawlani et al. and Sanghvi et al. who reported in their retrospective study that MRI is a highly sensitive technique which demonstrates fine anatomical details and identifies the early changes of arthritis, which are not visible on radiograph., Burrill et al. showed MRI was more sensitive than conventional radiography in assessing the extent of bone and joint involvement; however, he concluded that findings are less specific particularly in early cases of tubercular synovitis. In this study, we performed diagnostic arthroscopy and took a synovial biopsy of the knee joint in 21 patients who were clinically suspected to have tubercular or inflammatory arthritis. Out of 21 patients, 13 (61.9%) were diagnosed with inflammatory arthritis, and seven (33.3%) were diagnosed with tubercular synovitis. Arthroscopy not only helped us diagnose the condition but also aided in taking a synovial biopsy from specific sites which yielded adequate synovial tissue (98% in our study) for pathological examination. This was comparable to a study by Af Klint et al. where the yield of biopsies adequate for histology were 83% overall, 94% for knee joints and 34% for smaller joints. 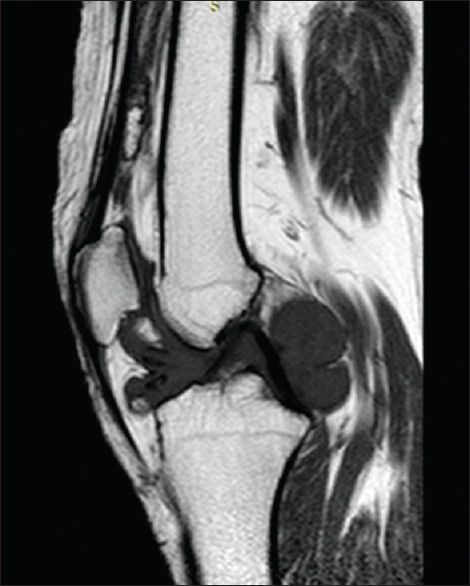 Synovial membrane hyperplasia and inflamed synovium were present in all the patients (100%) with knee involvement. We also studied the shape of villi and considered it to be a tool to make a diagnosis of infective or inflammatory synovitis [Table 10] and [Table 11]. Free-floating vegetations were also observed in 47.6% of the patients. This was supported by Kurosaka et al. who concluded that arthroscopic examination of various types of synovitis gives significant information. When the diagnosis of chronic monoarthritis is uncertain, arthroscopic examination and synovial biopsy should be considered. On arthroscopic examination, precise evaluation of the villi often provided a clue to the diagnosis. According to Revell and Mayston, arthroscopy is the best way to establish the diagnosis when seronegative inflammatory condition starts clinically as an atypical, immunologically silent chronic monoarthritis. Arthroscopy enabled us to study the appearance of the interior of the joint and the synovial membrane in suspected cases. 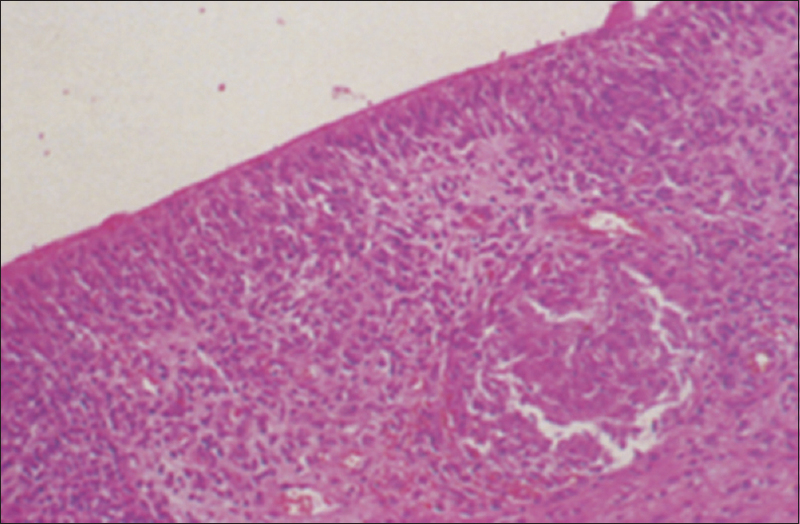 A synovial punch biopsy was taken from the most inflamed and hypertrophied areas of synovium. In 13 cases of 30 (43.3%), who were diagnosed with non-specific synovitis, it was found that they had significant relief of symptoms after arthroscopy. This finding is in corroboration with those of Gil et al. who noted an improvement in joint symptoms after arthroscopy. They attributed this to changes in pH and enzyme concentration of the synovial fluid. In this study, no patient deteriorated symptomatically after the procedure. In this study, arthroscopy was found to have a sensitivity of 83%–85% and specificity of 85%–86% in diagnosing both inflammatory and infective synovitis. The most common histopathological diagnosis in our study was chronic inflammatory synovitis (16; 53.33%) followed by tubercular synovitis (12; 40%). Of the 16 cases diagnosed with chronic inflammatory synovitis, 13 cases involved the knee joint and one case involved the elbow joint. The histopathological diagnosis of tubercular synovitis was made in six patients involving the knee joint and four patients involving the elbow joint [Graph 5]. The most common synovial biopsy finding of the knee joint was non-specific inflammatory change (12; 57%) which was suggestive of chronic inflammatory monoarthritis. Out of the five cases of monoarthritis of the elbow joint, the presence of granuloma (4; 80%) and proliferation of epitheloid cells (3; 60%) were the most common findings histopathologically. These findings were suggestive of tubercular synovitis. The histopathological findings of synovial biopsy from joints other than the knee and elbow joints demonstrated non-specific inflammatory change (50%) and the presence of granuloma with proliferation of epitheloid cells (50%). 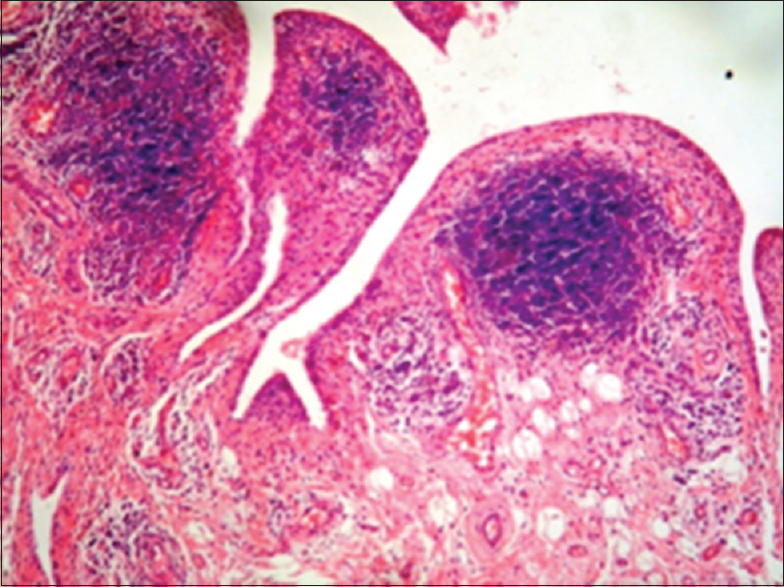 Lymphocytic infiltration was observed in 25% of the patients. Inaoui et al. reported a low diagnostic yield of synovial biopsy in diagnosing rheumatoid monoarthritis. A positive diagnosis of rheumatoid monoarthritis was made only in two out of 16 patients by the aid of synovial biopsy. Joint fluid cytology failed to assist in making a diagnosis in undifferentiated monoarthritis as well. Marquet and Amouroux et al. demonstrated synovial biopsy was a poor diagnostic tool to diagnose chronic inflammatory monoarthritis., Gibson et al. and Villiaumey et al. demonstrated that synovial biopsy had a poor specificity in providing a definite diagnosis using synovial biopsy in patients with chronic monoarthritis., Inaoui et al. concluded that the diagnostic benefits of synovial biopsy in tuberculous synovitis remain indispensable. In this study, six cases involving the knee joint were diagnosed by the histopathological appearance of epithelioid cell granuloma, but none of the slides showed the presence of AFB on Ziehl–Neelsen staining. Thus, histopathology appears to be the most sensitive investigation (100% positivity) for early cases of tubercular arthritis. Regarding cases diagnosed, histopathology was able to diagnose 12 cases out of a total of 30 patients with chronic monoarthritis (40%). These findings are comparable to those of Razdan et al. who used arthrotomy and reported an 84.6% positivity rate of synovial biopsy out of already diagnosed cases of tubercular arthritis and 12.56% positive detection rate in suspected cases of tubercular arthritis (40% in our study). The 100% positivity rate of synovial biopsy is in agreement with earlier studies (80% by Misgar and Hussain, 92% rate by Reisis et al. and 100% positivity by Jain et al.,,). In this study, the culture of both synovial tissue and synovial fluid was done using the conventional LJ medium. The culture of synovial tissue was found to be positive in four patients (33%). The findings are in corroboration with other studies in the past who have reported the sensitivity of AFB culture in the range of 48.6%–80%.,,,,, The definitive diagnosis of TB still requires its isolation on culture media. The study also resonates with the observation by Johnson and Freemont that the diagnostic usefulness of a synovial biopsy exceeds that of synovial fluid, implying that it does have an important role in diagnosing cases of chronic arthritis. Both synovial fluid and biopsy should be evaluated for bacteriological assessment. AFB smear (ZN staining) did not demonstrate AFB in any of the patients. This is in agreement with previous results that the paucibacillary nature of synovial TB makes a direct smear on synovial fluid samples of limited use., Thus, while AFB smear is an important modality for pulmonary TB and the basis for DOTS, it was found to have a negligible role in diagnosing tuberculous arthritis. 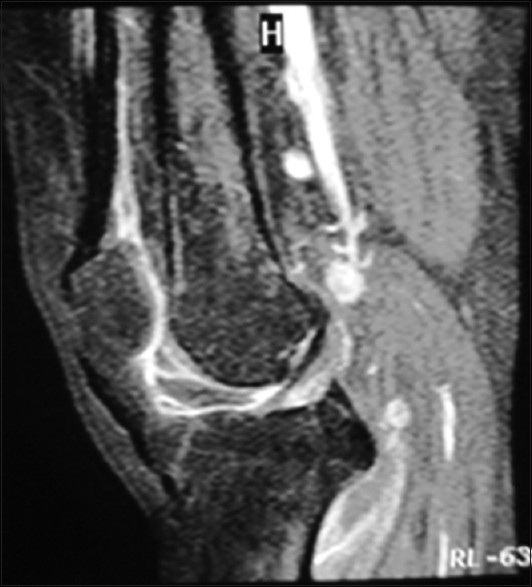 Although conventional radiography can be used as the sole method of following up the known joint destruction in chronic inflammatory arthritis, MRI is recommended as additional techniques in the initial diagnostic evaluation when radiography yields negative results. When assessed together with a histopathological examination of the synovium and mycobacterial cultures, MRI imaging forms a powerful tool in diagnosing tubercular synovitis early. These similarities may be used in the future to define common guidelines for MRI as a tool for diagnosis. Arthroscopic joint evaluation is an asset which should be used wherever feasible for a complete evaluation of the knee joint along arthroscopic-guided biopsy. Not only does it increase the diagnostic yield of the biopsy but can also diagnose other associated conditions. Synovial biopsy is the most sensitive investigation for early diagnosis of tuberculous and inflammatory arthritis and should be performed in all suspected cases. AFB smear has no role in diagnosing tubercular arthritis due to poor sensitivity. Thus, we conclude that MRI is an important tool in the early diagnosis of tubercular and non-specific synovitis even before confirming by histopathology and culture of synovial tissue; however, histopathology appears to be the most sensitive investigation (100% positivity) for early cases of tubercular arthritis. The authors would like to acknowledge the contributions of the Department of Pathology and Radiology of V.M.M. C and Safdarjung Hospital, New Delhi. Handa R. Approach to seronegative arthritis. Sarcoidosis. 2003;4:190-2. Bresnihan B. Are synovial biopsies of diagnostic value? Arthritis Res Ther 2003;5:271-8. Sawlani V, Chandra T, Mishra RN, Aggarwal A, Jain UK, Gujral RB, et al. MRI features of tuberculosis of peripheral joints. Clin Radiol 2003;58:755-62. Inaoui R, Bertin P, Preux PM, Trèves R. Outcome of patients with undifferentiated chronic monoarthritis: Retrospective study of 46 cases. Joint Bone Spine 2004;71:209-13. Berney S, Goldstein M, Bishko F. Clinical and diagnostic features of tuberculous arthritis. Am J Med 1972;53:36-42. Allali F, Mahfoud-Filali S, Hajjaj-Hassouni N. Lymphocytic joint fluid in tuberculous arthritis. A review of 30 cases. Joint Bone Spine 2005;72:319-21. Lertsrisatit P, Nantiruj K, Totemchokchyakarn K, Janwityanujit S. Extraspinal tuberculous arthritis in HIV era. Clin Rheumatol 2007;26:319-21. Lafond EM. An analysis of adult skeletal tuberculosis. J Bone Joint Surg Am 1958;40-A:346-64. Enarson DA, Fujii M, Nakielna EM, Grzybowski S. Bone and joint tuberculosis: A continuing problem. Can Med Assoc J 1979;120:139-45. Hoffman EB, Allin J, Campbell JA, Leisegang FM. Tuberculosis of the knee. Clin Orthop Relat Res 2002;(398):100-6. Tuli SM. Tuberculosis of the Skeletal System: Bones, Joints, Spine and Bursal Sheaths. 3rd ed. Bangalore: Jaypee Brothers; 2004. Solomon L, Warwick D, Nayagam S. Apley's System of Orthopaedics and Fractures. 8th ed. London: Hodder Arnold; 2001. Razdan AN, Bhargava KS, Ram A. Synovial biopsy in osteoarticular tuberculosis. J Indian Med Assoc 1966;46:422-4. Milgram JE. Diagnostic inaccuracy in tuberculosis of bone, joint and bursa. JAMA 1931;97:232. Pitkeathly DA, Griffiths HE, Catto M. Monarthritis. A study of forty-five cases. J Bone Joint Surg Br 1964;46:685-96. Shen HL, Xia Y, Li P, Wang J, Han H. Arthroscopic operations in knee joint with early-stage tuberculosis. Arch Orthop Trauma Surg 2010;130:357-61. Martini M, Gottesman H, Martini-Benkeddache Y, Daoud A. Conservative treatment of osteoarticular tuberculosis of the elbow. Rev Chir Orthop Reparatrice Appar Mot 1977;63:539-44. Kaarela K, Tiitinen S, Luukkainen R. Long-term prognosis of monoarthritis. A follow-up study. Scand J Rheumatol 1983;12:374-6. Fletcher MR, Scott JT. Chronic monarticular synovitis. Diagnostic and prognostic features. Ann Rheum Dis 1975;34:171-6. Zmantar C. Inflammatory rheumatism unclassified. Retrospective study over ten years 1989. Thesis Clermont-Ferrand. Auquier L, Cohen de Lara A, Siaud JR. Course of 173 cases of monoarthritis and monoarthropathies with an inflammatory appearance. Rev Rhum Mal Osteoartic 1973;40:125-9. Tuli SM. General principles of osteoarticular tuberculosis. Clinical Orthopaedics and Related Research 2002;398:11-9. Foley-Nolan D, Stack JP, Ryan M, Redmond U, Barry C, Ennis J, et al. Magnetic resonance imaging in the assessment of rheumatoid arthritis – A comparison with plain film radiographs. Br J Rheumatol 1991;30:101-6. Boutry N, Morel M, Flipo RM, Demondion X, Cotten A. Early rheumatoid arthritis: A review of MRI and sonographic findings. AJR Am J Roentgenol 2007;189:1502-9. Babyn P, Doria AS. Radiologic investigation of rheumatic diseases. Rheum Dis Clin North Am 2007;33:403-40. Ridley N, Shaikh MI, Remedios D, Mitchell R. Radiology of skeletal tuberculosis. Orthopedics 1998;21:1213-20. Burrill J, Williams CJ, Bain G, Conder G, Hine AL, Misra RR, et al. Tuberculosis: A radiologic review. Radiographics 2007;27:1255-73. Martini M, editor. Tuberculosis of the upper-limb joints. In: Tuberculosis of the Bones and Joints. Berlin, Heidelberg: Springer Berlin Heidelberg; 1988. p. 80-110. Gylys-Morin VM, Graham TB, Blebea JS, Dardzinski BJ, Laor T, Johnson ND, et al. Knee in early juvenile rheumatoid arthritis: MR imaging findings. Radiology 2001;220:696-706. Graham TB. Imaging in juvenile arthritis. Curr Opin Rheumatol 2005;17:574-8. Hervé-Somma CM, Sebag GH, Prieur AM, Bonnerot V, Lallemand DP. Juvenile rheumatoid arthritis of the knee: MR evaluation with Gd-DOTA. Radiology 1992;182:93-8. Brower AC. Use of the radiograph to measure the course of rheumatoid arthritis. The gold standard versus fool's gold. Arthritis Rheum 1990;33:316-24. Hartley RM, Liang MH, Weissman BN, Sosman JL, Katz R, Charlton JR, et al. The value of conventional views and radiographic magnification in evaluating early rheumatoid arthritis. Arthritis Rheum 1984;27:744-51. Sanghvi DA, Iyer VR, Deshmukh T, Hoskote SS. MRI features of tuberculosis of the knee. Skeletal Radiol 2009;38:267-73. Af Klint E, Catrina AI, Matt P, Neregråd P, Lampa J, Ulfgren AK, et al. Evaluation of arthroscopy and macroscopic scoring. Arthritis Res Ther 2009;11:R81. Kurosaka M, Ohno O, Hirohata K. Arthroscopic evaluation of synovitis in the knee joints. Arthroscopy 1991;7:162-70. Revell PA, Mayston V. Histopathology of the synovial membrane of peripheral joints in ankylosing spondylitis. Ann Rheum Dis 1982;41:579-86. Robles Gil J, Katona G, Barroso MR. Arthroscopy as an aid to diagnosis and investigation. InExcerpta Medica International Congress Series 1968;143:16. Marquet D. The histology of the synovial membrane in mono-arthropathies. Diagnostic report and anatomo-evolutionary confrontation concerning 131 cases 1981. Thesis Medicine Clermont-Ferrand. Amouroux J, Cywiner-Golenzer C. Contribution of the synovial biopsy in the diagnosis of mono and oligo-arthritis. Rheumatology News presented to the Paris practitioner: Expansion Scientifique;1979. p. 140-6. Gibson T, Fagg N, Highton J, Wilton M, Dyson M. The diagnostic value of synovial biopsy in patients with arthritis of unknown cause. Br J Rheumatol 1985;24:232-41. Villiaumey J, Strauss J, Di Menza C, Larget-Piet B, Rotterdam M. Les monoarthrites rhumatoïdes. Rev Rhum Mal Ostéoart 1973;40:627-34. Misgar MS, Hussain A. The role of synovial biopsy in tuberculosis synovitis knee. J Indian Med Assoc 1981;77:125-7. Reisis N, Dendrinos G, Fragiadakis E, Trouli H, Hartofylakides G. Value of tissue biopsy in bone and joint tuberculosis. Acta Orthop Belg 1989;55:12-6. Jain AK, Singh M, Rijal R, Ramachandran VG, Jena SK. Comparison of culture and nucleic acid amplification methods for diagnosis of tuberculosis of the dorsal spine. Curr Orthop Pract 2010;21:171-6. Holmdahl HC. Tuberculosis of the knee; a review of 170 cases. Acta Orthop Scand 1950;20:19-49. Lakhanpal VP, Tuli SM, Singh H, Sen PC. The value of histology, culture and guinea pig inoculation examination in osteo-articular tuberculosis. Acta Orthop Scand 1974;45:36-42. Wilkinson MC. Synovectomy and curettage in the treatment of tuberculosis of joints. J Bone Joint Surg Br 1953;35-B:209-23. Hald J Jr. The value of histological and bacteriological examination in tuberculosis of bones and joints. Acta Orthop Scand 1964;35:91-7. Dobson J. Prognosis in tuberculosis of the hip; an analysis of the results of treatment and of the factors which influence the end-result. J Bone Joint Surg Br 1951;33B: 149-59. Johnson JS, Freemont AJ. A 10 year retrospective comparison of the diagnostic usefulness of synovial fluid and synovial biopsy examination. J Clin Pathol 2001;54:605-7. Wallace R, Cohen AS. Tuberculous arthritis: A report of two cases with review of biopsy and synovial fluid findings. Am J Med 1976;61:277-82. Jain AK, Jena SK, Singh MP, Dhammi IK, Ramachadran VG, Dev G, et al. Evaluation of clinico-radiological, bacteriological, serological, molecular and histological diagnosis of osteoarticular tuberculosis. Indian J Orthop 2008;42:173-7.